For Conor O’Shaughnessy, a weekend spent fishing on a lake is ideal. But on a trip to Durrance Lake last weekend, the angler found himself pitted against one of nature's top predators. After catching a few fish while bobbing in the middle of the lake, O'Shaughnessy felt as though he was being watched. "The eagles started to take an interest," he said, adding that there were roughly four or five eagles eyeing up his success on the lake. He decided to call it quits and to head back out the following day. As soon as he got out in the water Sunday, he noticed more peering eyes from the tree tops. Then when O’Shaughnessy hooked his first fish of the morning, he heard yelling from the dock behind him: "Here it comes, here it comes!" The yelling was coming from people screaming at him as an eagle swooped out of the tree and dove right beside him, missing his fish. After that he decided to get his cell phone ready just in case, to capture the next attempted fish heist. "Normally I keep the first fish for dinner, then play catch and release for the rest of the day," said O’Shaughnessy. Every time he hooked a fish an eagle would come swooping out the trees, looking for an opportunity to steal a meal. 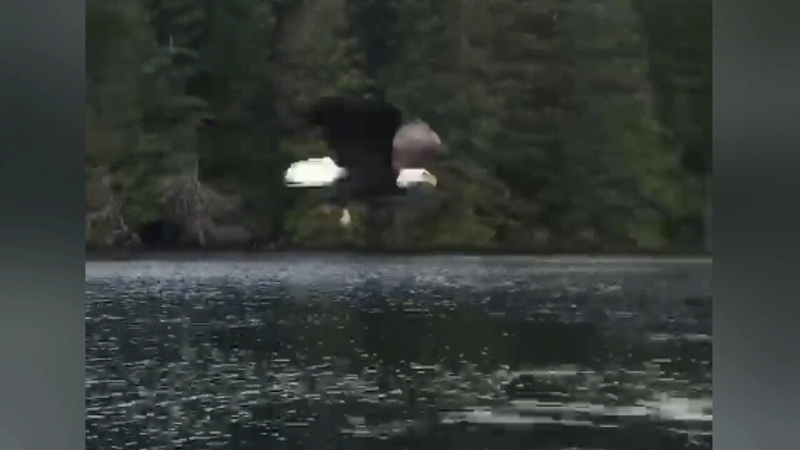 Fortunately for the fish, it would dive below the water line before the eagle could grab it – until one didn’t. "It took me by surprise to say the least, he came in pretty hard and hit it like a freight train," he said. The eagle managed to grab his trout while the fish was still attached to the line. It was a close encounter that nearly cost him his rod and cell phone. "I could just barely hang onto my rod, that’s why the video gets a little funny at the end there," he said. "He starts flying away and starts taking line." Being in a tough situation, it was all he could do to hold onto all his belongings. "I pointed the rod right at him and palmed the reel to break the tip it. I didn’t want to be attached to an eagle for too long." In the end the eagle ended up with a with dinner and O’Shaughnessy ended up with a broken fishing line and a great story to tell, with the video to prove it. "I was pretty amped up after that," he said. "After that they seemed to leave me alone." As to what he’s going to do differently next time, O’Shaughnessy said he’ll hold onto his rod a bit tighter and maybe get himself a GoPro Camera with a floaty, just in case. A bald eagle steals a fish from the end of Conor O'Shaughnessy's line at Durrance Lake Sunday, Feb. 3, 2019.